A new series returns to the world of Beautiful Creatures. Some loves are cursed...others are dangerous. Ridley Duchannes will be the first to tell you that she's a bad girl. She's Dark. She's a Siren. You can never trust her, or even yourself when she's around. Lucky for her, Wesley "Link" Lincoln can never seem to remember that; quarter Incubus or not, his heart is Mortal when it comes to Ridley. When Link heads to New York City to start a music career, Ridley goes along for the ride-and she has her own reasons. As if leaving small-town Gatlin for the big city, trying to form a band, and surviving life with a partially reformed Siren isn't hard enough already, Link soon learns he has a price on his head that no Caster or Mortal can ever pay. Kami Garcia and Margaret Stohl, the #1 New York Times bestselling coauthors of Beautiful Creatures, are back and casting another magical spell. Their signature mixture of mystery, suspense, and romance, along with a dash of fun and danger, will pull fans in and leave them begging for more. 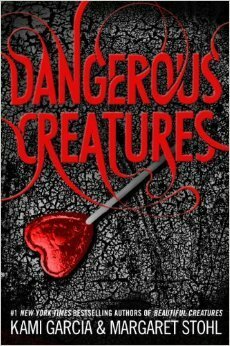 Kami Garcia and Maragret Stohl are continuing their Caster legacy with Dangerous Creatures, a new series with characters from Beautiful Creatures. This series will focus on Link and Ridley, the unlikely Siren and Part Incubus couple. Most of the book is written with the main character focus on Ridley, though Link does have some sections of his own, as does Lennox Gates. I never thought of Ridley as a bad or a good character. More like a victim of circumstance. She wasn't my favorite but she did play an important role in the Beautiful Creatures series. Ridley, by nature as a Siren, is Dark. She's incredibly selfish, self involved, bratty, and doesn't play well with others. As Ridley is an outsider, many readers can relate to her because this feeling is universally understood. Everyone has a past experience where they've felt out of their element. Though not many readers are as villainous as Ridley. The plot of the novel, and (safe to assume?) series, revolves around revenge. Link killed Abraham Ravenwood with a pair of gardening shears after being lured by Ridley and, though he is on the Otherside, he isn't too happy about it. Enter Ridley who owes a gambling debt to Nox, a Dark Caster who is being threatened by Ravenwood to kill Ridley and Link. Add all previous ingredients to a NYC Underground Dark Caster Club, mix with a Necromancer, an Illusionist, a Darkborn and voila! Chaos ensues. Though I love Stohl and Garcia's writing, their world of Casters, and the plot line, I had trouble connecting with Ridley and caring what happened to her. Not that I think she deserves to be locked in chains and forced to do Dark work... I just wish I would have made a stronger connection with her early on in the Creatures world so that a firm foundation would have already been laid out. No matter what, you can bet that I'll be reading the rest of the series now that the foundation is in place.